The Cresta Verde Golf Course has been in business since 1927, when Randolph Scott opened it under the name Parkridge Country Club. This 70 par course was popular with many well known actors, as Scott was a star himself. Actors including Lucille Ball, Burt Lancaster and Clark Gable could be found putting around at this Corona hot spot. 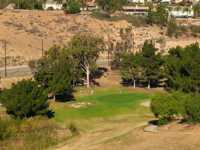 While the Cresta Verde Golf Course has remained popular, it still offers cheap golf in Corona. This course offers 18 holes, covers 5,922 yards, and has a slope of 123 degrees. The 18 holes vary in difficulty, so that golfers of all abilities can enjoy it. Corona tee times, and Cresta Verde Golf Course tee times, can vary as well as their prices. The Cresta Verde Golf Course is easy to find, as its located right off of two major freeways, at the junction of 91 and 15. They offer private lessons and semi-private lessons, and they have a snack bar located on the premises. Their prices are very reasonable and their staff is helpful and friendly. The views from the tees are gorgeous, green hills with a mountain range in the background. You wont find a golf course in Corona with a better value!